After I felt that my 6yr old son was somewhat comfortable with the simplest concept of multiplication ("2 x n" means to double "n"), I wanted to take another baby step into the wonderful world of multiplication. 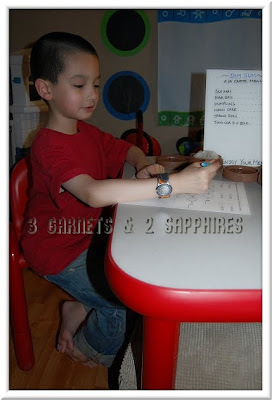 To help me in this task, I created a worksheet to show my son how to multiply with 1, 2, and 3. 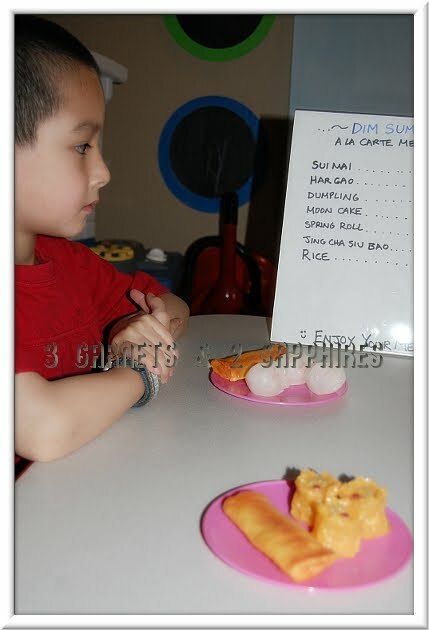 Then I used three pretend dim sum sets to illustrate, practice, and reinforce what was in the worksheet. I really think that one would not successfully do the job without the other. 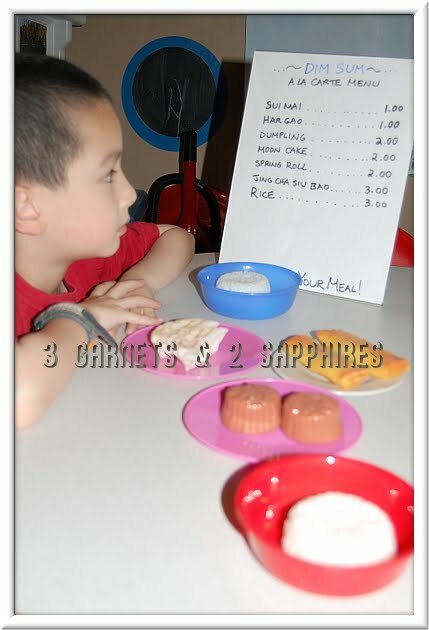 In the end, we want the child to be able to tell us how much a dim sum order would cost based on how many of each item is ordered. 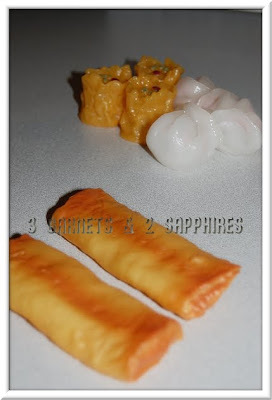 The first thing we did was tackle the worksheet before we started playing with the food. The worksheet is meant to show your child that two times a number is the same as two of those numbers added together and that three times a number is the same as three of those numbers added together. 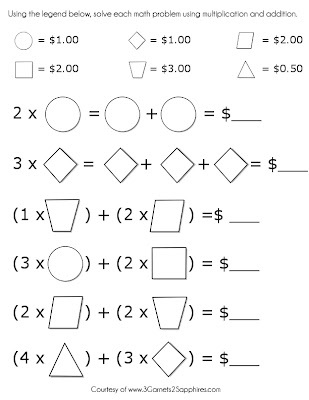 Your child will have to look at the legend at the top of the page to find out how much money each shape is worth. My son found it helpful to write the number each shape represented right inside that shape. in 7 sizes and 10 colors. 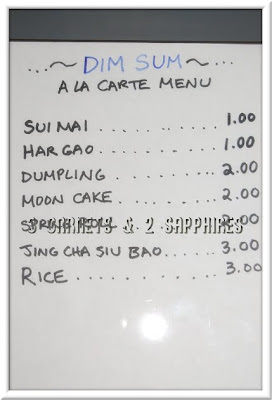 To help with the next part, I hand-wrote an a la carte Dim Sum menu, which included the name and price of each play food item. In order to make it simpler, I used all whole dollars. Here are examples of some of the questions I posed to my son . . .
How much would each plate of food cost? Instead of adding the price of each item on the plate together, what if you used 3 x $1.00 instead? How much would both plates of food cost together? 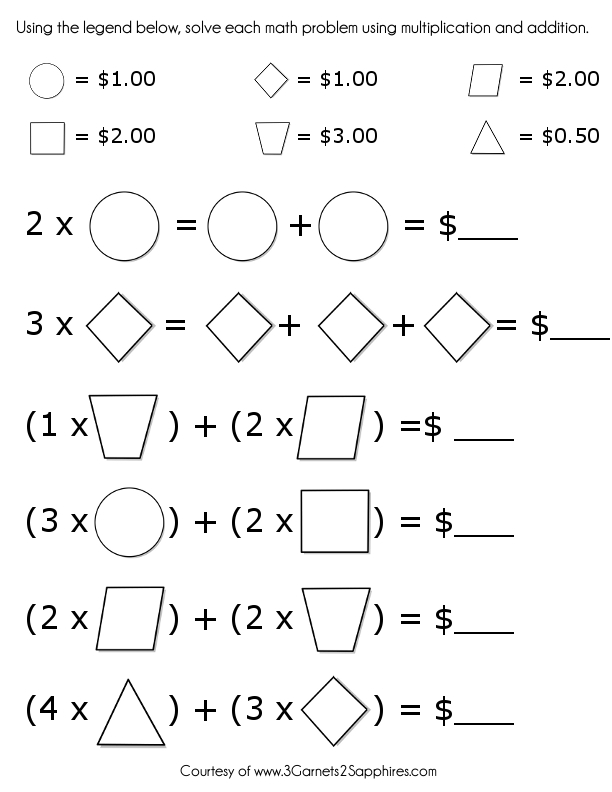 What if we grouped together all the items that cost $1.00 and used 6 x $1.00? 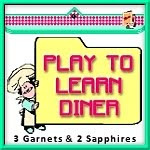 We did several similar lessons with different quantities of food. This was by far the toughest learning activity I have tried with my son. Although I think that he is beginning to understand the concept of basic multiplication, I will need to design additional activities for more practice. If anything, my son became very good at adding a series of numbers together in his head. After we were done with the lesson, my son was excited to serve me some dim sum. I was so pleasantly surprised that he remembered the names of most of the food items. 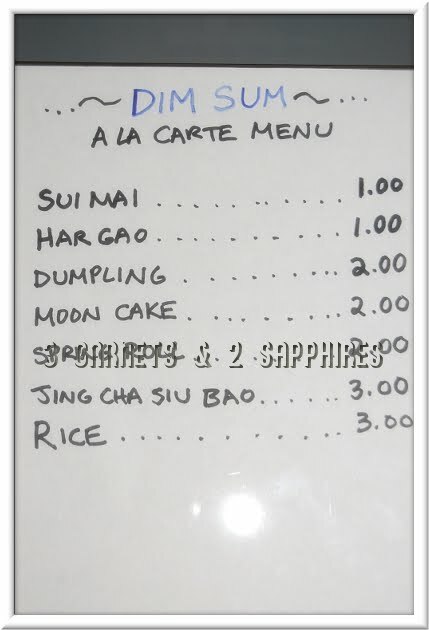 What makes this set great is that there are so many different items, which is a main characteristic of having dim sum. If you have never had dim sum, I highly recommend it. It would be a great experience for both you and your children. 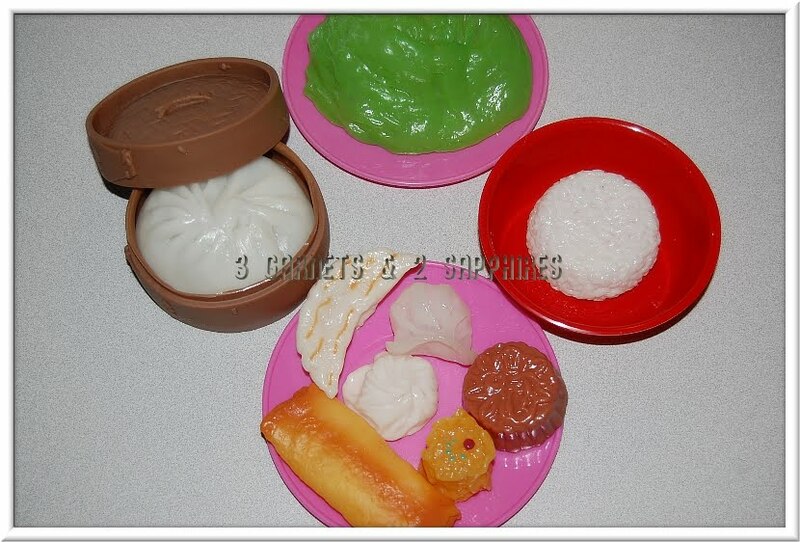 This dim sum toy sells for just $11.99 per set on Discount School Supply. You should note that the lettuce leaf in the set that I received is rounded, but the one shown on the site is a flat single leaf. If you are thinking about giving this toy to a child as a gift, there is a wonderful book that would make a perfect add-on to that gift . . . "Yum Yum Dim Sum" by Amy Wilson Sanger. This is one of my favorite board books to read to my children. Thank you to Discount School Supply for sending us three food set samples free of charge to use in this learning activity.